Happy National Donut Day! I had originally intended not to post about today but decided at the last moment to acknowledge it with some of my favorite donut memories. Or doughnuts if you insist. Mental Floss did a roundup of 17 Extreme Donuts That Look Like They’ll Kill You and my donut shooters from last year was listed at #11. It’s a great honor and if you’re here because of that, welcome! The photo shoot of the donut shooters were taken shortly after we had signed the papers to the house and the donut holes we purchased from Vons were stale. Being one who hates to throw away food, I suggested we put alcohol in them and pop them in our mouths. Delicious. The shot glasses are the only two remaining glasses of a four glass set that spelled out They Might Be Giants when put together. 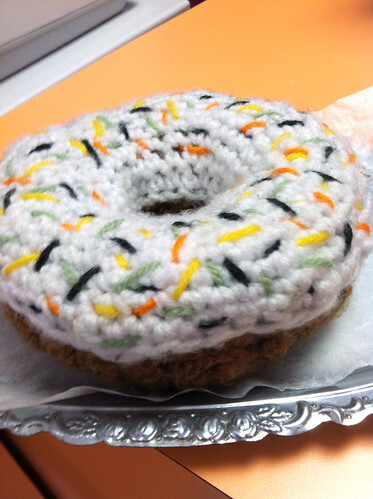 Donuts can be also be found in inedible forms like the crochet donut I spied at Christy’s Donuts in Serra Mesa. The woman behind the counter had her cousin knit it up especially for the shop. Shortly after we moved into our house, good friend Erin from Iowa sent us this marvelous needlepoint featuring a donut, of course. It proudly hangs in our kitchen. I’m so amazed at her needle work and time she spent to make this for us. 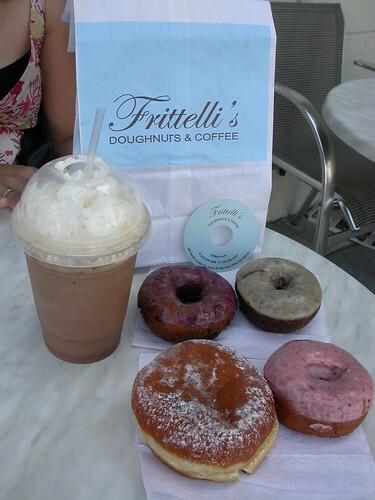 In the way of departed donut shops, I miss Frittelli’s Doughnuts & Coffee the most. It was situated in Beverly Hills and had the best peanut-butter-and-jelly-filled donut I’ve ever tasted. 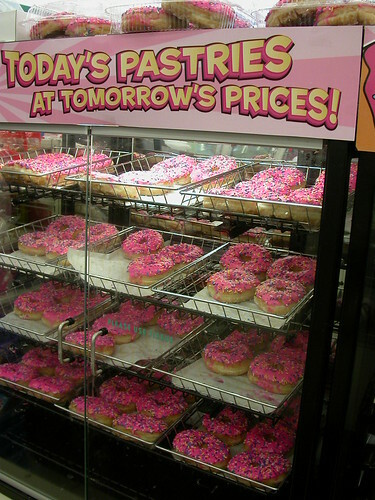 By way of fictional donuts, back in 2007, Paul and I ventured to Burbank to check out the 7-Eleven transformed into Kwik-E-Mart in conjunction with The Simpsons movie. It was cool to be able to walk into the store and grab a bright pink donut. 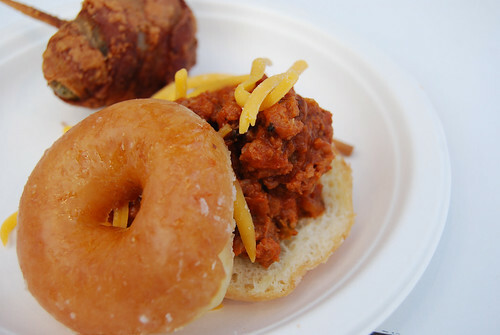 The most recent donut atrocity I encountered was the Krispy Kreme Sloppy Joe being offered at this year’s San Diego County Fair. It’s a waste of a perfectly good donut and I don’t even like Krispy Kreme. Hope you’re having a Happy National Donut Day! The crochet donut is so cute! Nice post, Darlene. 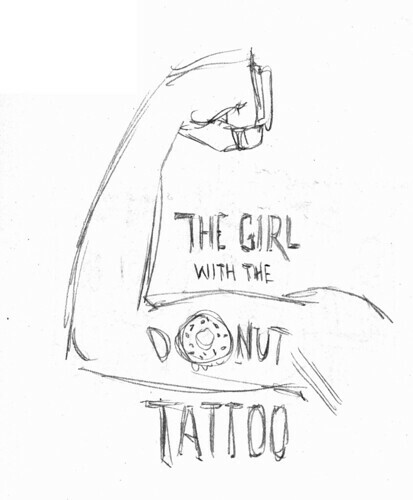 You should totally get that donut tattoo! Yeah, but what holds me back is when I see old military men and what used to be their cool tattoo, I rethink it. Maybe when I’m 60! I want one too. Or learn to make it myself because really? How hard can it be??? Wow. 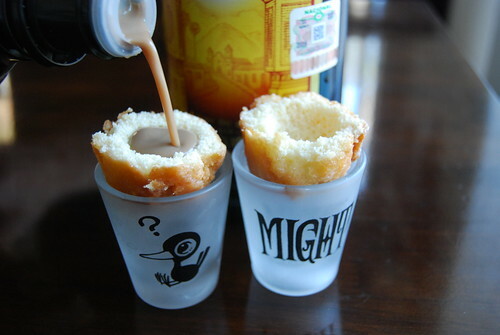 Donut shooters- that’s really something. I just had a bright idea! Someone should make a coffee cup cozy in the shape of a donut/or one decorated with donut images.